With the release of the dual core devices in market Samsung and HTC have both released dual core android flagships which features top of the range specs and performance. Now for most users it becomes difficult to choose between the two devices. These two devices are top of the line. They feature almost similar specification and performance and to majority of the user what matters is the performance and looks rather than the number of processor or other kind of technical details. So in this article we have compared these two monsters so that it becomes easier for you to choose between the two devices. Samsung Galaxy S2: this device is built completely out of plastic which not only keeps the weight down but also makes the device very durable. The device is incredibly thin with dimensions of 125.3 x 66.1 x 8.5 mm and weighing only 116g. The device is very comfortable to hold and it doesn’t feel cheap at all despite the all plastic body. This device is built solidly. HTC Sensation: HTC made sure to keep metal in the device and the back cover is completely made out of metal which takes up to the edge of the screen. You will find that there is plastic in between the metal which helps to improve the grip of the device. Metal gives a premium quality of the device but it also increases the weight which is at 148g. The device has dimensions of 126.1 x 65.4 x 11.3 mm. Verdict: looking at both the device it is a win for Galaxy S2 because it is thin and weighs less as compared to HTC Sensation. If you prefer metal over plastic then sensation is the device to go for. Samsung Galaxy S2: Samsung have fitted it with their own processor Exynos chipset which provides excellent performance in 3D and as well as its hardware accelerated which gives smooth performance in all areas. You won’t expect any lag or slow down at all. The processor is Dual-core 1.2 GHz Cortex-A9 with Mali-400MP graphics chip. 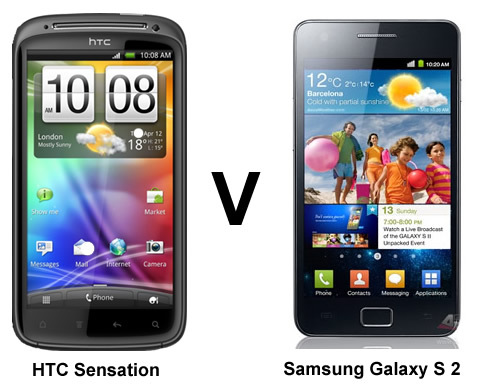 HTC Sensation: HTC are using MSM8260 Snapdragon chipset which is less powerful as compared to the exynos chipset. The processor Dual-core 1.2 GHz Scorpion with Adreno 220 graphics chip. The processor fails at 3D performance. Verdict: The processor in Galaxy S2 is more powerful if you’re into 3D graphics and HD videos. But if your not into heavy graphics then HTC Sensation will do the job for you. Samsung Galaxy S2: it comes with 1 GB of RAM from which user available is 835Mb which is adequate enough to multi-task many apps at once. It is difficult to use up all the available 835Mb of RAM. In storage you get 16 GB or 32 GB of internal storage which can be expanded via microSD card up to 32 GB. HTC Sensation: comes with 768Mb of RAM from which only 579Mb of RAM is available to the user. This amount of RAM can be easily exhausted and at times you can feel it during multi-tasking with lag and slow downs. In storage department you get only 1 GB of internal storage which can be expanded by microSD up to 32Gb. You get 8 GB microSD card when you buy the device. Verdict: HTC fails in the RAM and storage department. With limited amount of RAM you will feel slow and lag during multi-tasking and also the storage is very less. It is a clear win for the Galaxy S2. Stay tuned for more feature comparison between the dual core flagship device. We hope so far it has been easy to understand and in the following part it will help you to decide between the two devices.